As the 2014 American Cup get’s started, the energy is high and people are excited. At this point in the quadrennium, the tension around winning this event is absent and everyone is having fun.The lights dim, strobe lights fill the arena and we start with a little song and dance.The gymnasts march in and things start to get serious. As expected, the American’s dominated on vault. Neither Elizabeth Price or Brenna Dowell brought their best vault, but they still shot ahead of the pack with their powerful amanars. Behind them was Giulia Steingruber with a nice rudi (the vault Alicia Sacramone used to do) and Victoria Moors with a DTY. The rest of the field had pretty low start values. Next up, uneven bars. Brenna Dowell absolutely rocked bars, doing her crazy Tweddle+Ezhova combination better than I have ever seen it. In warm up she had bent legs and crazy form, but she did straight legs and feet together! The crowd went nuts. Carlotta Ferlito and Sophie Scheder both had a really great swinging set of bars. Carlotta had some form breaks and Sophie got a little off in her routine, but they both delivered cleanly. Victoria Moors and Vanessa Ferrari have both improved so much on bars over the years! They had a few little form issues, but got through fairly well. Roxana Popa Nedelcu started off so strongly on bars but then slammed her feet on the mat on her pak (immediately after the little girl behind me said, wow no one has fallen on bars) and then couldn’t recover and had to jump off. Elizabeth flew so high on her release moves, and went clean on her bars with a stick to boot. She increased her lead coming out of the second rotation. Brenna is first up on beam where she was cleaner than she has been in training. However lots of bobbles and starts and stops and a missed connection left her with only a 13.3. Giulia and Victoria both brought nice, steady routines. Victoria did her full-in dismount and ended with a NCAA style finish! Vanessa, who has looked so strong in warmups did not have her best routine. She did a back tuck in a series that normally is a layout and had a few other mistakes. Elizabeth Price is up next and delivered what was probably her best beam routine I have ever seen her do! She missed a few of her splits, but was rock solid on all her skills and ended with a stick. Carlotta started with a beautiful beam routine, one of the prettiest of the meet. But she falls on one of her combinations. The top four have been in the exact same order since the first rotation, and even with such a low beam score for Brenna nothing changes. Elizabeth, Brenna, Giulia and Victoria. This line-up is full of great floor workers, so this is a rotation to sit back and enjoy. Things get started with Carlotta, who looks beautiful on floor. She really gets the crowd going with her clappable music and her enthusiastic performance, She does a graceful, sassy routine. Sophie follows her, with beautiful jumps, leaps and turns, but a fall on her last pass. Next up is Vanessa, who is one of the best in the world on floor. She does a great routine. So wonderful to see her floor routine in person! Roxana flies high in her double layout and then gets what might have been some of the loudest cheers on the night with her whip whip tumbling pass. A very fun routine. Giulia looks so much cleaner to me on floor than at worlds. She does a great routine as well. Elizabeth is next and does a solid routine. She flies high, has solid landings and hits everything. I like this routine better than her previous one, but she still has some room to grow on the performance and dance side of floor. Brenna has such great tumbling skills and beautiful presentation. She is so beautiful on floor, but has a big hop on her first pass and lands out of bounds on her second pass. However, it is just enough to take second. And we finish out the night with what I flew across the country for – Victoria Moors on floor. Victoria has quite a pike in her double twisting double layout and lands it out of bounds. But it is awesome to see! The rest of her routine is enchanting, every nuance of music used perfectly. The crowd was actually quiet – mesmerized I think. What a great ending to the meet! There was a great presentation of medals and of World Cup standings at the end of the meet to wrap up the 2014 AT&T American Cup. With Simone Biles, Kyla Ross and Larissa Iordache all out of the American Cup due to injury, the all around competition looks to be much more wide open – and much more even than in recent years. Though I am sad not to see these amazing girls compete, it definitely sets us up for a great all around competition. Elizabeth Price has won three world cup events in the past two years. Brenna McDowell has yet to be tested on this type of international stage, but she has the goods if she delivers. The two Americans both have the advantage with their awesome Amanars on vault. But the international field is all looking very good and have all been tested on the world stage! Vanessa Ferrari of Italy just keeps getting better with age. She came in sixth at the 2013 World Championships and has looked good here. Giulia Steingruber of Switzerland was just after her in 7th at Worlds. The next three girls were all packed together at Worlds. Victoria Moors of Canada in10th, Carlotta Ferlito of Italy in 11th and Roxana Popa Nedelcu of Spain in 12th. Rounding out the field is Sophie Scheder of Germany. Victoria Moors on floor! I cannot wait to see this live! Victoria is one of my all time favorite floor workers, and with her double double layout, she will be hard to beat on floor if she lands on her feet. She has also brought in some upgrades on beam. Brenna and Elizabeth on vault. Sophie on bars. Vanessa on floor. Carlotta on beam. And though I don’t write about men’s much…. you CANNOT miss Fabian Hambuechen on High Bar! This looks to be a GREAT American Cup competition even without the prominent stars. And here we go! The women are starting vault! And so it begins. It often seems that the roster for the American Cup is a bit of a game of musical chairs. 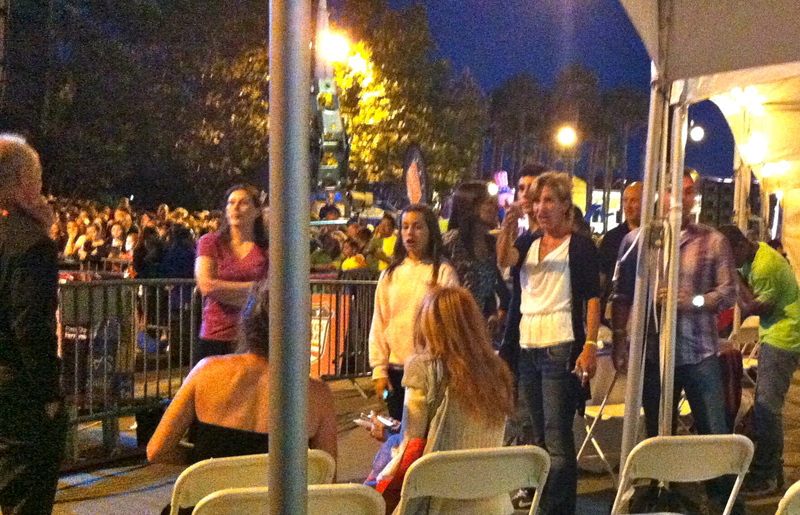 Two years in a row, Kyla Ross finds herself without a chair when the music stops. The American Cup is at a very awkward point in the elite gymnastics cycle. Many gymnasts are still focusing on skill acquisition for the upcoming year, others are nursing small injuries, saving themselves up for later in the year. Kyla once again finds herself in the later camp with a minor back injury. Though it doesn’t have huge repercussions in the scheme of things for national and world titles, there is a prestige in winning the American Cup that Kyla keeps missing out on. Last year, Elizabeth Price and Kyla Ross were both replaced as the American representatives at the American Cup due to injury. Now this week, ironically, Elizabeth Price will be replacing Kyla Ross. For Elizabeth Price, this is a chance to unpress pause on her last year of gymnastics. Ebee, as she is affectionately known, took the World Cup series by storm after the 2012 Olympics, where she was an alternate. She won the Stuattguart and Glasglow World Cup at the end of 2012, and looked to be America’s next big name in gymnastics going into 2013. Then, before the American Cup she injured her hip. She pulled out of the competition to recuperate and be prepared for the bigger competitions later in the year. Then she injured her other hip later in the spring. Though she gave valiant performances at Nationals, she just wasn’t able to come back soon enough to be in play for the World team. Late 2013, she once again had phenomenal performances at the World Cups. Let’s hope she can truly un-press pause, and have the year in 2014 that we all thought she would have in 2013. Healthy, and a top player in the world of USA gymnastics. Read more in the USA Gymnastics Press Release. Many people have come to consensus on the team, but the alternates still seem to be up for grabs. Most people are choosing alternates based on having girls that can step in on any event. And I understand that philosophy – it is usually who alternates are. But we get to take not one, not two, but three alternates! And, in my mind, the team that is going already has people who can step in on any event should they need to. So I am choosing my alternates by having someone that can contribute a team finals worthy score on every event should we loose someone on that event. This approach has led me to a surprising conclusion. For vault, I choose Alicia Sacramone. I could also see Elizabeth Price in this role. 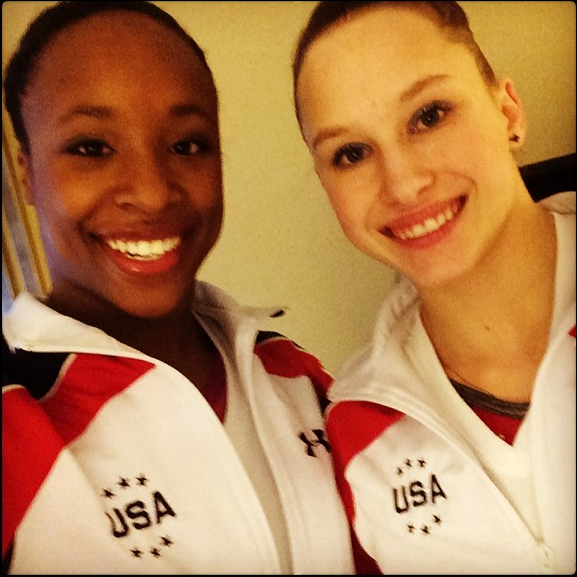 But Alicia is my very favorite girl and she could also win a vault medal. Bars has to be either Anna Li or Rebecca Bross. When it comes to the international judging and bars dependability, I choose Bross. Beam could be Sarah Finnegan or Alicia Sacramone. Finnegan can score higher, but Sacramone is much more dependable and Finnegan has never been tested on a world stage. Beam at Olympic Team Finals is a scary place to start. Last but not least is floor. The only choice for me is Sarah Finnegan. 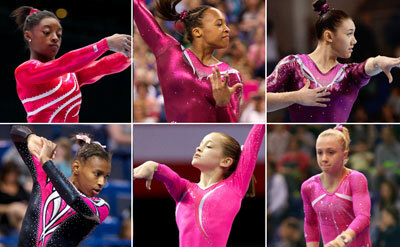 So this leads to Alicia Sacramone, Elizabeth Price, Anna Li, Rebecca Bross, and Sarah Finnegan. My three would be Sacramone, Bross and Finnegan. What about you and why?